Two players, each with a celebrity partner, competed. An electronic marquee displayed a series of asterisks, denoting the number of letters in the answer to a question that scrolled across the marquee. One member of each team took part in each question, with the first player to buzz in with the correct answer winning a point. The first player to reach 5 points won the game and advanced to the bonus round. The celebrity and the contestant each manned a flipper on a giant pinball machine. Inside the machine were seven bumpers, each winning a prize when hit (a larger prize was split between two flippers; both had to be hit to win it). Each bumper also scored 500 points, while other noisemakers scored 200 points. After 60 seconds, the flippers went dead. If, with two balls, the team could reach a goal that started at 15,000 points and decreased by 1000 points each time it wasn't won, the team could then play a "money ball" which scored $200 for every time it hit a bumper or other noisemaker. If you're wondering why there aren't any pictures for this rulesheet, the tape quality of the episode I have is quite bad. If someone would like to snap a few screenshots for me, please e-mail me using the link on the left and I'll tell you what pictures I'd like. Thanks. 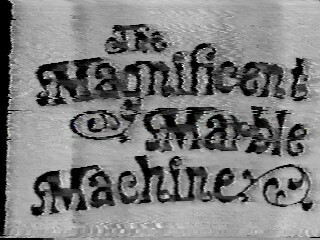 Just as Press Your Luck encapsulates all that was 80's culture, the Magnificent Marble Machine managed to capture all the gaudiness of the 70's. Not that such statement is positive - watching the show for a while exposes a main fault - more emphasis was paid to the look and the bells and whistles than the game. As noted by many, playing pinball is a lot more fun than watching it - especially when the machine you're watching isn't all that spectacular. Art James is not among my favorite hosts - his bombastic style seemed to be better left in the 60's.